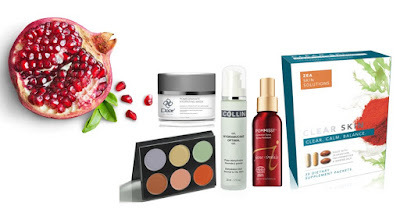 Girly Girl Giveaways: Pomegranate, the Superfood! Did you know that November is National Pomegranate Month? Aside from being a fun and delicious fruit that is totally good for you, pomegranate is also good for your skin. The antioxidants in pomegranate oil fight the free radicals and outside damage skin endures daily. Plus, it helps brightens lackluster skin and leaves a glowing radiance. Here are 5 products that contain pomegranate and all its benefits! This unique gel-based formulation is infused with Vitamin E and Organic Pomegranate Seed Oil to soothe redness, improve skin tone and brighten the skin. It is highly effective in alleviating stressed, sensitive or irritable skin. Clinical backings show results in just FOUR weeks--GUARANTEED! These powerful daily supplements help detoxify and balance your skin without over-drying. In combination with other leading antioxidants and vitamins, pomegranate seed oil is an active ingredient for its amazing antimicrobial properties. A refreshing facial mist that hydrates, conditions and protects all skin types. It features the added benefit of pomegranate extract, a powerful antioxidant and UV protector to reduce redness and inflammation. This multi-use cream palette is ideal for neutralizing and correcting varying skin tones, discolorations, sallowness and dark circles. The fragrance-free blend is infused with the power of pomegranate to protect and moisturize the skin with wear. The unique, ultra-fresh formulation is designed to balance the natural oil secretions of normal to oily skin experiencing dehydration. A recognized pioneer, G.M Collin is the first to combine pomegranate extract - which stimulates the skin's natural channels of hydration - with bamboo, water lily and lotus to increase water retention in the skin's cells. Have a happy pomegranate month!